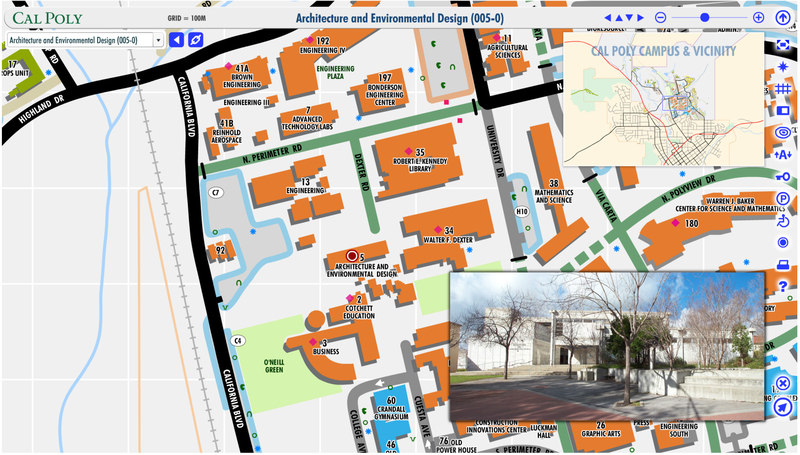 Architecture is one of five departments in the College of Architecture and Environmental Design (CAED), along with Architectural Engineering, City and Regional Planning, Construction Management, and Landscape Architecture. This unique combination of disciplines, all responsible in some way for the conception and production of the built environment, makes possible an integrative and interdisciplinary approach to the learning of architecture. For additional information, visit the CAED's web page. Acceptance into Architecture at Cal Poly, San Luis Obispo is highly competitive due to its reputation for excellence. The program receives many more applications than it can admit students. For example, in 2018-19, Cal Poly received 55,000 applications, 1,501 of which were for the Architecture Program, and 172 students had were accepted. Our students are some of the best and brightest in California. We encourage you to apply and join their ranks. DesignIntelligence: Cal Poly Architecture Program consistantly ranks among the best in the Nation! The Architecture Department ranked first in the nation among undergraduate programs in the 2014 DesignIntelligence survey ranking public and private degree programs nationally. Since then, we have held tight to the second highest ranking for 2015, 2016, and now 2017. Cal Poly’s Architecture program has made the nation’s Top 20 list since 2003 with a ranking of sixth or better. The education offered in the Architecture Department at Cal Poly is based on the polytechnic tradition. Graduates receive an education that finds its identity at the intersection of art and science. This curricular approach has been central to the Department’s tradition for 45 years and provides our graduates with a balanced education enabling them to be responsible design professionals in an ever-changing world. Cal Poly’s historical commitment to the pedagogy of learn by doing means an emphasis on hand-on, project-based learning that amplifies the interdisciplinary opportunities offered by the College’s five departments. Students learn to think creatively and critically, while directly applying their knowledge through a design-based education. We invite you to visit our campus and schedule a tour of the College of Architecture and Environmental Design (CAED) facilities. The CAED offers drop-in tours at 2:10pm on Mondays and 10:10am on Fridays, beginning in the 05-212 lobby. For more information, please visit the CAED Tour page: www.caed.calpoly.edu/CAED_tours. Please direct any questions to caedamb@gmail.com. A self-guided tour of the CAED is also available for unscheduled visits and can be downloaded HERE or picked up at the CAED lobby. For additional Cal Poly tour information, please visit: admissions.calpoly.edu/visit. California Highways 101 provide an easy and beautiful scenic ride from San Francisco or Los Angeles. Take the Cal Poly exit and proceed on Grand Avenue towards the North till you encounter the Main North campus entrance. Please request a visitor's parking permit and ask for directions to the Architecture Department. Please see Cal Poly Visitor Parking. For Architecture Department Administration and Staff contacts, visit the Faculty & Staff Directory. For additional Cal Poly information, go to the Cal Poly Visitors web page.